This is Bishop Foley Catholic's largest fundraiser. Please join us on Saturday, November 10, 2018. This is a wonderful evening filled with food, friends, family and fun! Classy-casual attire is recommended for this event. The online auction starts November 7. 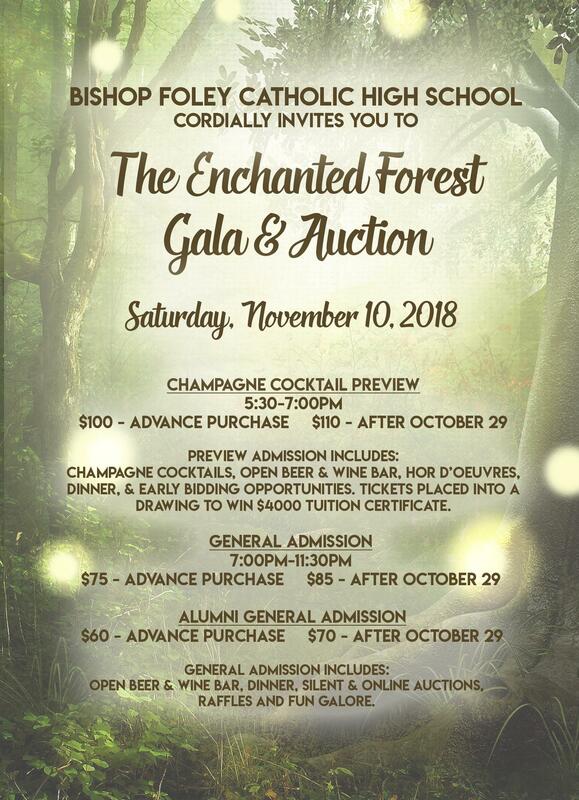 Admission includes: champagne cocktails, open beer and wine bar, hors d'oeuvres, sit down dinner, and early bidding opportunities. Also, an exclusive offer for preview guests: Tickets will be placed into a drawing to win a $4,000 tuition certificate which can be applied towards the remaining 2018-19 tuition or the 2019-20 academic year tuition at Foley. General admission includes: open beer and wine bar, sit down dinner, silent and online auctions, raffles, and more! Alumni general admission includes: open beer and wine bar, sit down dinner, silent and online auctions, raffles, and more! Please understand that the alumni ticket pricing is for alumni. Alumni status is verified.